As I finished the last page of this novel, my first thought was, “Oh wow!” While I would like to be able to express something more articulate and impressive, this was what came to me. 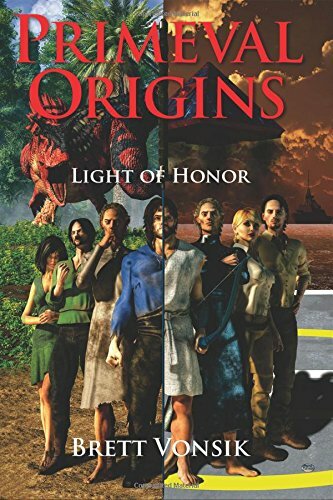 Even though “Primeval Origins: Light of Honor” by Brett Vonsik is the second book in a series, it stood well on its own. Because it is so exceptionally written, I would like to go back and read the first book and perhaps get a few blanks filled in. I also look forward to the next novel in this series. This epic fantasy begins in the future, introducing scientists from that time and two characters from the far distant past. The two ancient characters are warriors that have special gifts. When the vessel they are being carried on is attacked, the crew and the scientists aboard find themselves depending on these two men to help save them. Being that the attack was unexpected, there is a great deal of damage. Questions will arise in the readers mind about who these two warriors really are. Those questions are answered as the writer takes us way back in time, and we can see the journey these young men were sent on when they were captured, along with some friends and family members of one of the men. As they endure horrible living conditions and abuse at the hands of their captors, they also begin to discover their gifts. Going into the future, the gifts are greatly put to use to help save themselves and others who seek them. I totally enjoyed reading “Primeval Origins: Light of Honor” by Brett Vonsik. I was moved by the characters and the author’s vivid details of the conditions in which they were living. The personal evolvement of the characters was impressive, and it was both horribly suspenseful and entertaining to watch them put these talents to use. I feel that this series is destined to be recognized as a classic.